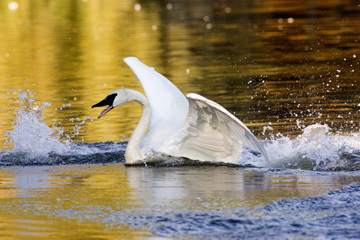 November is migration time for Tundra Swans which pour forth from the north. All observers are asked to be vigilant for sightings of marked TUNDRA SWANS WITH BLUE NECK BANDS FROM ALASKA. An impressive effort has gone into marking 1873 individuals in the last three years. Your observations will be key to success of this effort! 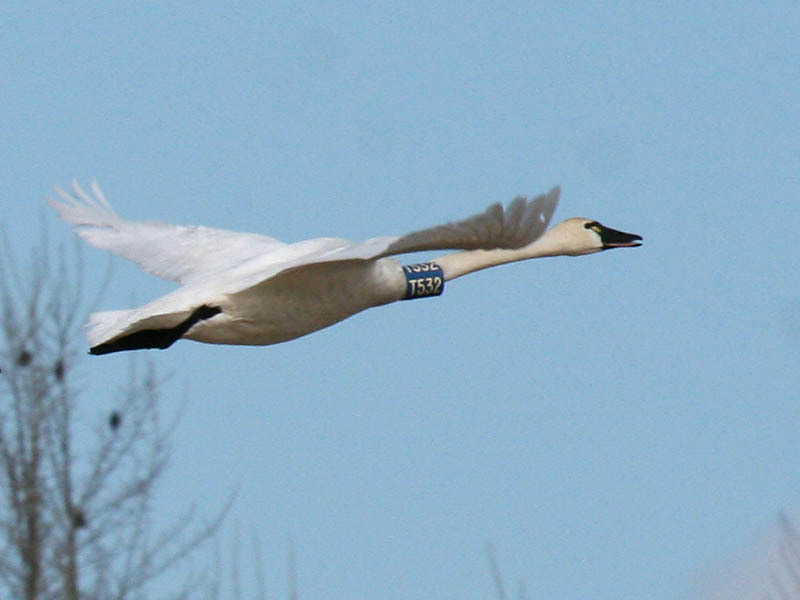 TUNDRA SWANS WERE MARKED IN WESTERN AND NORTHERN ALASKA IN THE SUMMERS OF 2006-2010 WITH CODED NECK BANDS AS PART OF AN EFFORT TO LEARN MORE ABOUT THE TIMING OF MIGRATION AND MOVEMENTS OF SWANS RELATIVE TO BREEDING AREA. NECK BANDS HAVE A FOUR-DIGIT CODE THAT BEGINS WITH A LETTER. CODES ARE READ FROM BOTTOM TO TOP. BANDS ARE BLUE WITH WHITE DIGITS, EXCEPT CODES T3##, WHICH ARE WHITE WITH BLACK DIGITS. This Alaska office, as well as the Bird Banding Lab WILL PROVIDE ALL OBSERVERS WITH A BRIEF HISTORY OF THE BANDED SWAN THEY OBSERVED. Those reported to TTSS will be forwarded to the BBL and to Craig. Thank you! The effects of climate change on Trumpeter Swan populations will likely be complex and will differ across their extensive range, which spans much of North America. Scientists have documented a shift in range for various species due to warming temperatures. As is the case with Trumpeters, as ranges shift northward, there can be different problems to the south. A recent Blog, entitled World Climate Report gleefully highlights this idea in their May 20th essay, and erroneously implies that the entire growth of the Alaskan Trumpeter population since 1968 is due to climate change. The Blog presents an idyllic photo of a Trumpeter with two cygnets, underscored with the caption “Trumpeter Swans Thriving in a World of Enriched CO2.” The authors appear to be unaware of the primary factors that fueled the increase of Alaskan Trumpeters, such as the cessation of the historic overharvest and the massive increase of agricultural food availability in their southerly wintering areas. It appears that the Blog is more focused on attempting to dismiss the serious problems caused by climate change than in increasing anyone’s understanding of the forces impacting Trumpeter Swan populations. Authors of this Blog quote extensively from The Trumpeter Swan Society website and chide TTSS for listing climate change as one of the problems facing Trumpeters. Unfortunately the World Climate Report made no effort to contact TTSS to understand why we include climate change as a problem facing Trumpeters. If the hosts of the World Climate Report had come to us to inquire why we list climate change as one of the problems facing Trumpeter Swans, we would have explained our concerns. As we have for over 40 years, we’ll celebrate success in one area, while keeping a watch on all sides of the issue and presenting the most accurate information available. If the World Climate Report had not closed their comment period so quickly after posting their essay, we would have submitted our comments to them. As always, we welcome your comments here.